To help His people resist satan and to fight spiritual warfare, God has designed spiritual armour for us to wear during our constant battle with sin & temptation. That's what Paul talks aobut in Ephesians 6! This armour is what God wears according to Isaiah 59v17, when He goes out to battle! What are the hallmarks of this spiritual armour? Truth - know, understand and live truth. Your life is to be controlled by truth as revealed in the Bible. When you know truth, you will be able to recognize the lies of the enemy! Righteousness - live a righteous life. As a Christian Disciple, you have been granted the righteousness of Jesus Christ! But that righteousness needs to be lived out in every aspect of your life! Gospel - be ready to share it and rely upon it. You have peace with God if you are a Christian, but you are to exhibit peace with others. Where peace is, the discord of our enemy cannot prevail! Faith - show total trust in God for your life. The faith you have is a defensive weapon against the mistruths that come into our head: lies, blasphemy, lust, greed, selfishness are all little darts thrown at us by satan. By maintaining our trust in God's promises and God's power, these little darts are extinguished. Salvation - assurance of salvation. Be assured! Let your mind be controlled by the Holy Spirit, so that you will not be led astray. Your salvation rests in nothing apart from God's promises and Jesus' righteousness! Bible - read and study God's Word. The Word of God, the Bible, is your attack weapon! Allow the precious Holy Spirit to lead and reveal it to you as you read it! Read it and grow in grace and in the knowledge of Jesus! Prayer - talk to God. This is how we are energized! When we talk to God, we strengthen our relationship with Him! Prayer is a sign of intimacy between God and yourself! It develops your relationship with Him! When we ask other Christian Disciples to pray for us, Church unity is strengthened! Put on your spiritual armour daily, just as you do everything else. How do you put on the armour? It is not through some mystical, deep and secret process that the spiritual armour is put on. It is by doing that the armour is put on! When God is glorified in your life, you are wearing the spiritual armour! When you are living an abundantly fruitful life for God, and giving all glory and honour to Him without compromise, you show that you are wearing your spiritual armour! It is your responsibility to wear it and use it with confidence. By using God's strength and being clothed in His armour, as a Christian, you will prevail and overcome. To partake, or to be a partaker of something, can mean at least three things! Firstly, it means having the qualities or attributes of something. Secondly it can mean having, giving or receiving something. Finally, to partake of something, means to consume! Jesus was, and is, a Partaker! Jesus Christ was a Partaker! Did you know that? He was a Partaker, in so much as that when He became human, He adorned human flesh and blood Hebrews 2:14-18. As a Christian Disciple, you also are a Partaker, for you are to hunger and thirst for righteousness or in other words, be Partakers of righteousness. In this pursuit of partaking after righteousness, the New Testament has a lot to say about what Christian Disciples are to be Partakers of. When you became a Christian, you became a Partaker of the Gospel - 1 Corinthians 9:19-23. When you take communion, you are a Partaker of the Lord's Table - 1 Corinthians 10:14-33. We live in a world that is in love with love. Love, according to some people, is what makes the world go around. In the Bible, God’s love is revealed. The Apostle John in 1 John 4 does not simply say that God loves, but rather that God is love. Remember that God is the Holy Trinity, three persons in one. The Trinity is a living, vibrant community of love, and every activity of the Trinity, is an expression of love. God loves because that is His very nature. Throughout the Bible, God’s love is described as an unfailing, everlasting, intimate, sacrificial, unbreakable, conquering, immeasurable and all-knowing. How is God’s love seen? It is seen in two ways. Firstly, it is shown supremely in that He has given His Son to be the Saviour of the world, so that if a person takes up that opportunity, they can know and enjoy God in a personal relationship. God had only one Son, Jesus Christ, and He sent Him on a rescue mission to seek the lost and to reconcile people to God. This is love in action. The lover dying for the ones He loves. If people see Christians that are not loving and kind, rightly or wrongly, the whole Church is branded as a bunch of fakes and hypocrites. Worse still, God is seen at best as nothing more than a distant uncaring irrelevant figure. The love between Christians is seen as a visible showing of the invisible God. The very character of the church should always be to reflect God in all aspects. The ultimate example of showing people God, is for you as a Christian, to love and be love. People should be seeing God’s love, through your love. For as Jesus said, “All men will know that you are my disciples if you have love one for another” (John 13:35). His love releases us from the things that so easilyentangle our daily walk with Him. The more you hold onto His love, the more you will desire it and the more it will be revealed in your daily life. Your love in action today, reflects God’s love in action on the cross. Go and love - to the glory of God! Maranatha! The word for today is Almighty God! Throughout the Bible, God is called Almighty. But how is God, almighty? God being Almighty, can be summed up in 3 words. Omnipresent – That is God is wholly present everywhere. fills the universe in all its parts without division (Psalm 139v7-12; Jeremiah 23v23-24). For example in Ezekiel 1, Israel is in exile in Babylon and they thought God was left in the Temple in Jerusalem. Yet God appears to Ezekiel in order to show that God was also in Babylon with His people! Omnipotent – That means God has unlimited power to do all things that are the object of power. With Almighty God nothing is impossible, yet there are things God cannot do such as He cannot do anything that is contrary to His own nature. For instance, He cannot declare something infinite if that something is finite. Omnipotence is an essential quality of God for if God were not all-powerful then He would not be God and would not be worthy of worship. Remember, He stopped the sun during Joshua’s time! Amazing power! God created the universe with His eternal and infinite power! God made everything out of nothing and He sustains it and gives all of it life! Omniscient - God has perfect knowledge of all things. The Psalmist writes: O Lord, you have searched me and you know me, You know when I sit and when I rise…You discern my going out and my lying down; you are familiar with all my ways (Ps. 139:1-2a & 3). God knows all things, past, present, and future and all possible circumstances and outcomes. Therefore He knows all that we do (which includes the remembrance of all that we have done), all that we think (and the record of those thoughts), and all that we do say and all that we could say. So God is Almighty in presence, power and knowledge and He is mighty to save. As we seek to live holy lives, let us remember that whatever we do, Almighty God is watching. Watching not to condemn us, but watching in order to love us as any good father does to his children. What is heaven like? People, both believers and non-believers have an opinion about Heaven! To some its where everybody will meet up after death providing they weren't too bad in this earthly life! The caricature of the comedians is that heaven will be floating around on clouds and playing a harp! So what does the Bible, the foundation for all serious Christian thought, have to say about heaven? The first thing to say is that Heaven is a physical place! The Bible describes Heaven as a House (John 14:2); a Kingdom (Matthew 25:34); Paradise (2 Corinthians 12:2-4); Holy City (Revelation 21:2)!. These are all descriptions of Heaven's physical properties! Now, look & listen at all these characteristics the Bible offers about heaven! Joy (Luke 15v7-10); Rest (Revelation 14:13); Peace (Luke 16:19-25); Righteousness (2 Peter 3:12); Service (Revelation 7:15); Reward (Matthew 5:11-12); Inheritance (1 Peter 1:4); Glory (Romans 8:17-18). No sitting around on clouds there - for instance: service implies working! Who is it for and who can enter? Who is it prepared for and who can enter Heaven? It is for all those recorded in the Book of Life (Malachi 3:16-18; Philippians 4:3); the Righteous (Matthew 5:20); the obedient (Revelation 22:14) and those who are declared holy (Revelation 19v8). People enter heaven through giant gates of pearl (Revelation 21:21). A pearl is formed as an oyster suffers, covering a grain of irritating sand, until the irritation ceases. Now what do you think the suffering was that created these giant pearls that are the gates? It can only be the cross and the incredible suffering and pain that Jesus endured upon it. It is only through the death of Jesus on the cross that you can be declared holy and righteous! Only those who have been declared holy will be able to stand in the presence of Almighty God! As a Christian Disciple, your current attitude towards heaven should be to desire (2 Corinthians 5:2-8), eagerly keep watch for (2 Peter 3:12) and to put your treasure there (Luke 12:32)! We also see from the Bible that Heaven is prepared, and a pure place! Prepared: Jesus promised us "I am going to build a place for you" (John 14:1-4). Jesus has been working on heaven for almost 2000 years!! Jesus has prepared a place for those who love Him, trust Him and obey Him as King. He is expecting us, wanting to lavish His love upon us. Pure: Heaven is also a pure place (Revelation 21:1-4). Today we all suffer in some way. When our King returns, no more will man's inhumanity to man be allowed. No more pain. No more death. No more suffering. No more sin. Perfection attained and it is to the glory of an Almighty and merciful God, that this will occur. All this doesn't mean you are not to be so heavenly minded, that you are of no earthly use. Rather, you are not to be so earth bound, that you are not tied to Jesus in your eternal home - heaven! Won't you tell somebody today, about heaven and how they can get there with you? Q1. Read Luke 10:20. How can I help others to have their names written in Heaven? Q2. Read 2 Peter 3:12. How am I looking forward to Heaven? You are to live at peace with everyone and not to be proud or vengeful (Romans 12vv17-20). You are to do what is right in the eyes of other people and exhibit positive goodness. You are to make every effort to do what leads to peace & mutual edification Romans 14:13-19, and not place stumbling blocks in front of others! As a Christian Disciple, you have the gift of peace with God, from the God of peace (Philippians 4:4-9) given to you by Jesus Christ who is the Prince of Peace! (John 14:27). You are to be a peacemaker, by having internal peace, this shows the fruit of the Spirit. When faced with troubled times & a troubled world, you can have peace through an untroubled, unfearful heart & mind (John 16:33). How do you gain peace within? If you have found this resource helpful to you, please do prayerfully consider making a donation. Paul writes in Titus 2v1: "You must teach what is in accord with sound doctrine. " The word ‘doctrine' in a lot of places is unfashionable. They say that doctrine belongs to a time gone by, and that new experiences of God and miracles from God are all that matters. Some churches teach only what they think people want to hear, tickling the ears instead of exposing them to biblical truth led by the Holy Spirit and therefore stirring them into living transformed lives for Jesus Christ. The words translated as "doctrine" are found frequently in the letters written by Paul, primarily 1 & 2 Timothy and Titus. The original words are didache (the act of teaching) and didaskalia (that which is taught) used fifteen times. are translated as doctrine. Doctrine is the study of God, as revealed through the pages of the Bible. The more you as a Christian learn about the God you have chosen to follow, the more you will be able to deal with the daily pressures of living in a world who does not want to know about God. You will continue learning and understanding the very nature of God and therefore be wise in your actions and reactions to conflict and circumstances. You will continue to develop the relationship between yourself and the God you serve. Doctrine is for all Christians, regardless of education, time of knowing the God personally and status within your church. Indeed, everybody, Christian or not, have doctrines whether they want to have a doctrine of belief or not - that includes atheists who have a doctrine of non-belief! So, for all people, Christians particularly, doctrine matters. Doctrine matters because what you believe about God, ultimately affects how you will behave. If as a Christian you have solid, biblical doctrine being practised in your life, you will be living a life of total obedience to Jesus Christ. For Christians are to hunger and thirst after righteousness (Matthew 5v6) and this only comes through the continuing work of the indwelling Holy Spirit. As the mind is renewed and transformed (Romans 12v1) with teaching about Jesus Christ, what the mind learns is put into practice, and your life is being transformed into the image of Jesus Christ. People will start asking you about the reason for the hope you hold onto. That way the Gospel and Good News of Jesus Christ is spread. This hope is also an unending hope, which will enable you to endure to the end and run the race marked out for you. Finally, learning solid doctrine is important is so that you will be able to discern true Apostolic & biblical teaching from the false teaching of heretics and those who want to lead you astray from the truth. Experiences and miracles are important, but to base your Christian life upon them, and not on solid biblical doctrine, produces a rollercoaster effect and not the constant reliance on the indwelling Holy Spirit for direction, guidance and trust. Serving God and others is the mark of a spiritually mature Christian Disciple and through service, we reflect the greatest servant of all, Jesus Christ. It was He, who came in order to serve and give his life for others (Mark 10:45). As Christian Disciples we are to be as Jesus Christ (Romans 8:28; Philippians 2:5) and to serve. Yet if we are honest, we sometimes feel incapable, just as Moses did (Exodus 3). An excellent example to follow is that of Stephen in the Book of Acts. As a Christian Disciple, you are called to a life of serving God and other people. You are not alone to do this however, but are part of a larger body of people, where each person is also called to perform a serving function. By serving others, it shows unity and solidarity to those outside of the church who frequently accuse the church of infighting and "devouring one another". The Christian life is not to be static or inactive. The Christian life is to be dynamic and active. The word servant is key in Scripture. It is used at least 500 times in its various derivations. Spiritual growth comes from serving rather than being served. This is because what ever is given in service of God and others, faith grows and Jesus Christ gives back even more. Jesus speaking in Matthew 25:15-30 tells of the rewards for faithful service and the penalties for being faithless. Serving others is a sign that you, as a Christian Disciple, trust God and are having faith in Him. By serving others, you fulfil the command that Jesus gave to love God and love others. Showing love and serving each other through your Spiritual Gifts and giving, achieves this aim of obedience to Jesus. As the church, we are dependent upon each other, just as one part of the human body has dependence on another part. That is why we serve each other and use the gifts generously given by God. When you, as a disciple of Jesus Christ, serve in any capacity, then God's honour is released. This is done because service shows the beauty and glory of Jesus Christ to those being served and to those watching. That is to be our motive for service. Serving is never about what you can get out of it. When that is the motive, God is not glorified. God's glory and supremacy is the goal of all those who would call themselves a Christian Disciple. So go and serve. Ask your church leader how you may serve Jesus in your church today. Right mouse click to save this Podcast in MP3. G’day and welcome to WISE! The word for today is justification. I wonder if you have come across this word in your reading of the Bible and wondered what it was all about!! Justification means, that God looks as you as if you have never sinned against Him. That means you are declared free from the penalty of sin. Justification is only a reality to you, if you have taken up the offer and are a follower of Jesus Christ. The basis of this justification is that God the Son, Jesus Christ, is both the Just and the Justifier of sinners (Romans 3:21-26). God is holy; therefore, sin must be dealt with. He cannot arbitrarily forgive sin. The judgment and penalty of sin, which is death, was poured out on Jesus Christ who is the substitute. Therefore justice has been done, because God is just. By faith in Jesus Christ we are declared righteous as a free gift, and Christian Disciples are therefore justified. Nothing we can do could make us justified before Almighty God. It is only through His free grace. Jesus died for your sin, the just for the unjust (1 Peter 3:18). That is how God is both just and the Justifier of sinners. That is why Jesus needed to be both fully God and fully human, so as to be the full substitutionary sacrifice that was required to deal permanently with sin! For while you were yet a sinner, Jesus Christ died for you, (Romans 5:6-8), willingly giving His life as a ransom for you (Mark 10:45) and when He died in your place on the cross, He bore the consequences of all your sin – past, present and future. This substitution was the sacrifice required in order that Jesus Christ could take away the sins of the world, which includes yours (John 1:29)! He therefore became sin for you (2 Corinthians 5:21) and it was His blood as the sacrificial lamb without spot or blemish (1Peter 1:18-19) that fulfils God’s requirements permanently. We are justified before God, because Jesus is our substitute! So I challenge you with this: if He who was without sin, became sin, for you, you are to live a life worthy of Him and your status of freedom from sin in Jesus Christ. 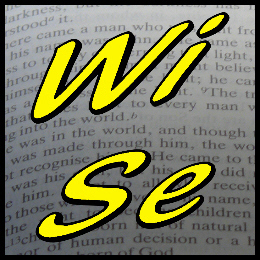 Welcome to WISE (Words In Scripture Explored)! The word for today is sanctification. Next time you are in a supermarket, count how many products there are on the shelves for cleaning! Oodles and oodles of them! Each one of them promising to make whatever is being cleaned, new again! Sometimes cleaning is hard work – particularly getting little boys or puppy dogs to take a bath! Cleaning and being cleansed, is a major part of living the Christian life! This is known as sanctification! This process of sanctification is where God the Holy Spirit transforms you into the likeness of Jesus Christ (2 Corinthians 7v18), as the fruit of the Spirit, “love, joy, peace, patience, kindness, goodness, faithfulness, gentleness and self-control”, is produced in your life as a Christian Disciple (Galatians. 5v22-23). This life-long process of sanctification is maintained by devotion to righteousness (Romans 6v19); with a desire and firm decision to live a life totally submitted to God. This is done by a work of God (1 Thessalonians. 5v23, Philippians 2v13), as you submit to the indwelling Holy Spirit. Sanctification is God’s way of showing He loves you. This sanctification is God showing you His love for you in action. He loves you far too much for you to remain as you are, but initiates and maintains this lifelong transformation into the very image of your Master, Jesus Christ, as you submit to Him. Sanctification can sometimes be a hard process, but the pursuit of righteousness and transformation is worth it, because by allowing yourself to be transformed and sanctified, you are also showing God how much you love Him. We live in a world that is in love with love. Love, according to some people, is what makes the world go around. Valentines day and the endemic materialism associated with it is evidence of that! There are more songs written about all kinds of love than perhaps any other subject! In the Bible, God’s love is revealed. The Apostle John in 1 John 4 does not simply say that God loves, but rather that God is love. Remember that God is the Holy Trinity, three persons in one. The Trinity is a living, vibrant community of love, and every activity of the Trinity, is an expression of love. God loves because that is His very nature. Throughout the Bible, God’s love is described as an unfailing, everlasting, intimate, sacrificial, unbreakable, conquering, immeasurable and all-knowing. How is God’s love seen? It is seen in two ways. His love releases us from the things that so easily entangle our daily walk with Him. The more you hold onto His love, the more you will desire it and the more it will be revealed in your daily life. Your love in action today, reflects God’s love in action on the cross. How will you reflect this God of love today, to the world around you? Go and love - to the glory of God! Maranatha!